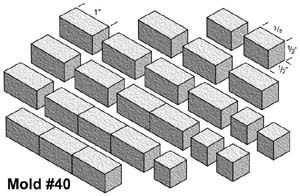 Used for building simple walls and structures. 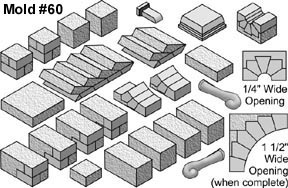 Contains several long one-piece blocks. 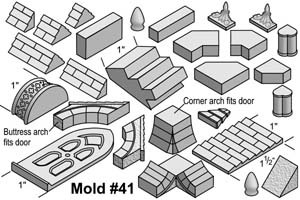 Click here for instructions on using this mold. 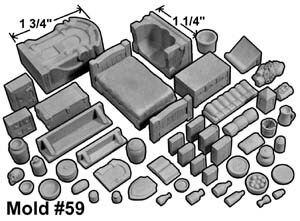 This mold contains additional pieces that enhance the gothic dungeon mold #45. 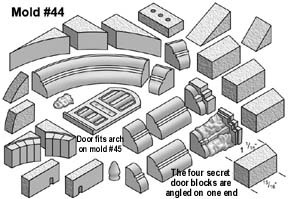 Can make a 1" wide door, smooth steps, octagon steps, 1" wide corner arch, roof sections and decorative pieces. 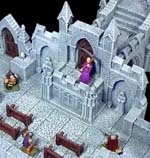 This mold contains additional pieces that enhance the gothic dungeon mold #45. Can make a 1.5" wide door, large pillars, 1/2" wide corner arch, 3/4 pillars, decorative base trim and other decorative pieces. 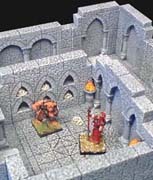 This mold contains additional pieces that enhance the gothic dungeon mold #45. 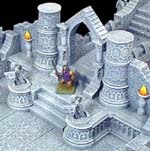 Includes decorative panels, trim pieces, crenellations, robed figure, gargoyle, bench and other decorative pieces. 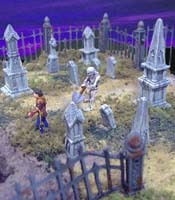 This mold contains additional pieces that enhance the gothic dungeon mold #45. 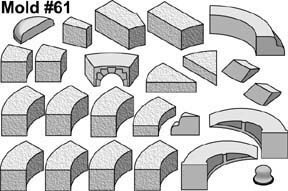 Includes great arch (3" or 4" wide) with face pillars, large arch (2" or 1.5" wide), secret door builder, prison door and other decorative pieces. 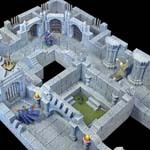 Will make all the walls to build the basic gothic dungeons and catacombs. This mold will make recessed arches in several sizes. 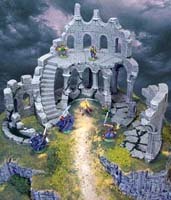 Includes iron gate, brazier, flame, pillars and bone pile. 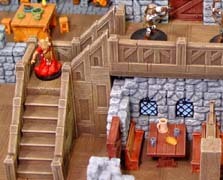 You will need floor tiles from mold #201 to complete the gothic dungeon. 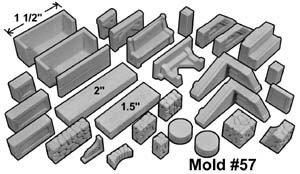 This mold is meant to be used with resin casting material. 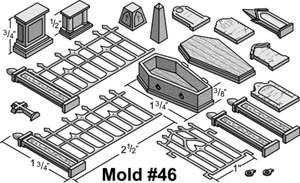 Will make all pieces needed to build a graveyard including a working hinged coffin, wrought iron fence sections, hinged gate, tombstones, monument bases and tops. Caution! 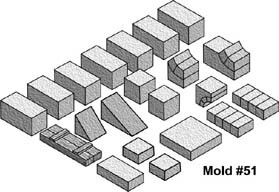 Resin casting material will deteriorate the mold if not used properly. Please refer to the Plastic Casting Instructions on the web site before using casting resin. Will make all blocks needed to build the wizard's tower. Includes arrow slit block, round window, and decorative braces. 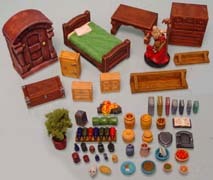 Click here for instructions on building the inn. Will make all blocks needed to build the Dragon's Inn. Includes sloped roof blocks, wooden shutters, large & small arches and floor tiles. Will make all blocks needed to build the Circular Tower. It measures 4" outside diameter. 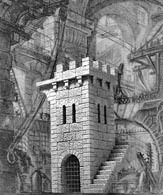 Also contains arrow slit blocks, decorative braces, circular stairway pieces and blocks to seamlessly splice curved towers into existing flat walls. 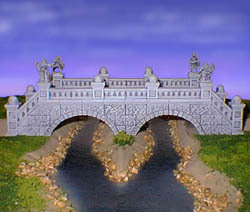 Click here for instructions on building the bridge. Will make all blocks needed to build the traveler's bridge. 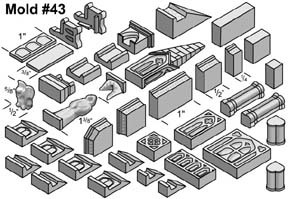 Special pieces include a 3" wide archway, bridge railings, stair builder block, and decorative trim pieces. Click here for instructions on building the church. 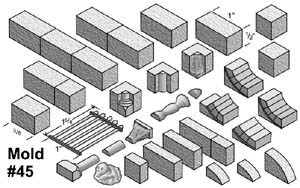 Will make blocks needed to build the Gothic Church. 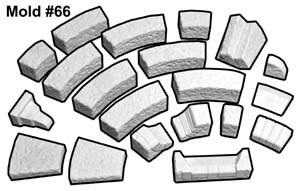 Includes 2 sizes of smooth arches, base trim, decorative caps, window trim and more. 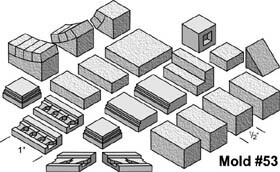 Additional regular blocks are needed to build the church. 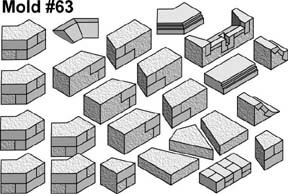 Will make blocks needed to build the Bell Tower. 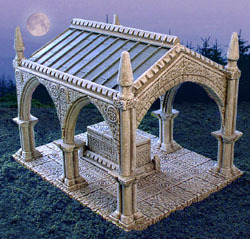 Includes 2 sizes of smooth arches, a deep recessed arch, large round window, window sills, and several decorative pieces. Additional regular blocks are needed to build the tower. 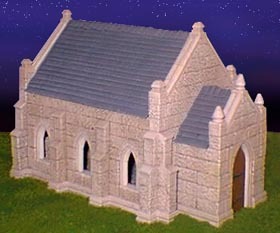 Click here for instructions on building the tomb. This is my largest mold to date. It will make all the blocks needed to build the tomb. 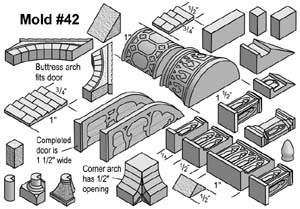 Pieces include buttress arches, large 2 1/2" arches, lead roof tiles, sculpted pillars, decorative capitals plus other decorative pieces. This mold is used to help finish the interior of an inn. Includes spiral and straight stairway pieces and rails, small stone pieces for fireplaces and ovens, wooden panels, rails and shelves, table and bench. 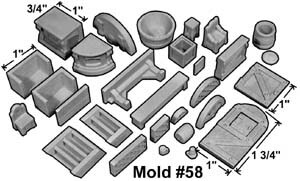 This mold has commonly used items to dress up the interior of an inn. 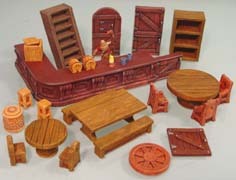 Includes 2 doors, bar counters, shelves, ship stairs, chairs round and square tables, chairs, window inserts and other small accessories. Caution! 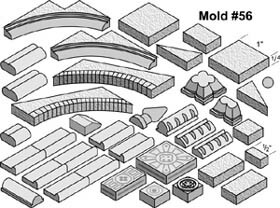 This mold contains several small detailed bits that are more difficult to cast them normal. To get good results you need to use a surfactant and a vibrating table to get the plaster into the small pockets of the mold. Please refer to the Advanced Casting Instructions page on using a surfactant and vibrating table. This mold has many tiny bits used to dress up an inn. Includes wardrobe, bed, desk, cabinets, shelves, wine rack, bottles, books, dishes and other tiny accessories. Caution! This mold contains lots of tiny tiny bits! To get good results you need to use a surfactant and a vibrating table to get the plaster into the small pockets of the mold. Please refer to the Advanced Casting Instructions page on using a surfactant and vibrating table. 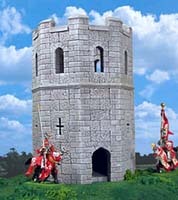 Click here for instructions on building the tower. This mold will make all of the blocks needed to build the Prison Tower. 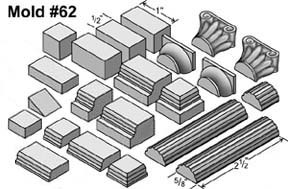 Includes 2 new sizes of Roman arches, decorative corner blocks plus special pieces to make wrap-around stairways. 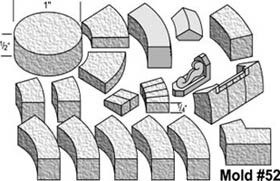 Click here for instructions on how to use the turret mold. 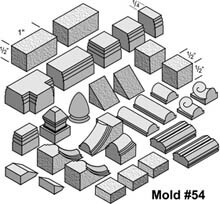 This mold will make all of the blocks needed to build small round towers and turrets. It measures 3" outside diameter. It includes a domed roof, round window, decorative base for corner turrets and blocks to seamlessly splice round turrets into existing flat walls. Click here for instructions on building the temple. 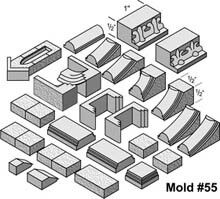 This mold will make all of the blocks needed to build the Roman temple. 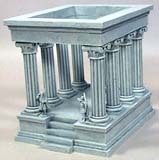 It includes fluted pillars, capitals, upper and lower Roman style trim, and several smooth blocks. Will make blocks to build a 5" wide octagon tower (measured outside from flat to flat). Additional basic blocks are needed to build the tower. It includes a new style of arrow slit, brick edged window arches and trim pieces. 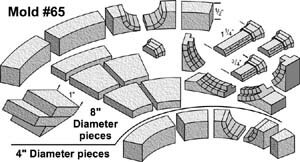 Will make blocks to build an 8" outside diameter tower. 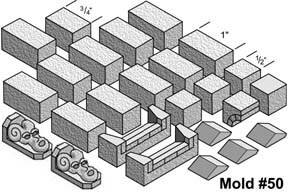 It includes basic building blocks, an arrow slit and decorative top pieces. 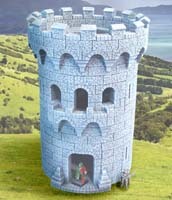 Also includes 9" pieces to finish the top of the tower. 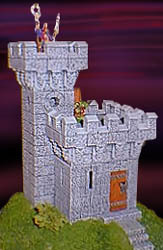 Click here for instructions on building the ruined tower. Will make all the blocks needed to make the ruined tower. 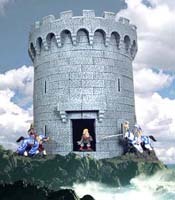 Includes pieces for both 8" and 4" diameter circular walls, large and small arches, octagonal pillars, floor tiles and a circular stair builder piece. 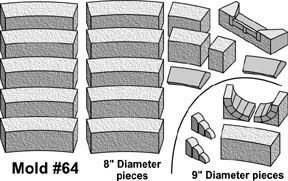 Will make blocks to build a 6" outside diameter tower. 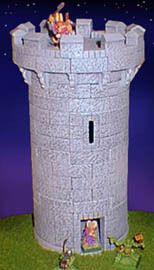 It includes basic building blocks, an arrow slit, round topped window, circular stairs, decorative top pieces and a 7" piece to finish the top of the tower. For an easily printable version of this page, see my Product Catalog on the Building Plans Page.